This Mid-December 2018, we are working closely with the mall Management to organize a Xmas Bazaar at the entrance of the uniquely shaped Breadtalk Building. This is an event not to be missed if your items are targeting the office crowd. The bazaar is held directly outside the mall main entrance, and visible to all shoppers whether they are going to the mall or to the Sakae building beside it during lunch time. or you may choose to take 3 days for $120. There will also be pending giveaways for minimum spendings on level 1. Workshops indoor on level 1 (19th - 21st December). The demographics are mainly office crowd who is going to Breadtalk building for lunch. There is also a good number of people during tea breaks. We allow vendors to close earlier if the traffic slows. All vendors are encouraged to wear red or green for this event. And do bring along a Christmas hat or a Santa beard to add to the atmosphere 🙂 All booths are encouraged to decorate with Xmas theme in mind. The best decorated booth will win a $20 NTUC Voucher. Take note of this location. It can be found in the photos below. In total, we can put no more than 10 - 15 stalls only. The event is expected to go out fast, kindly fill up the details below to join..
Booth allocation is assigned by the Organizer. To join, kindly contact or email us! Designed by award winning local architect Tan Kay Ngee, the architecture takes its cue from the many delicate textural layers of a Danish pastry and alludes to the dynamic and multi-faceted BreadTalk® Group, with its diverse and innovative lifestyle brands. Designed as a community based campus to foster closer work relationships, the new BreadTalk Corporate Offices will house courtyards and indoor greenery to stimulate the creative process and encourage interaction with co-workers at open and casual spaces. 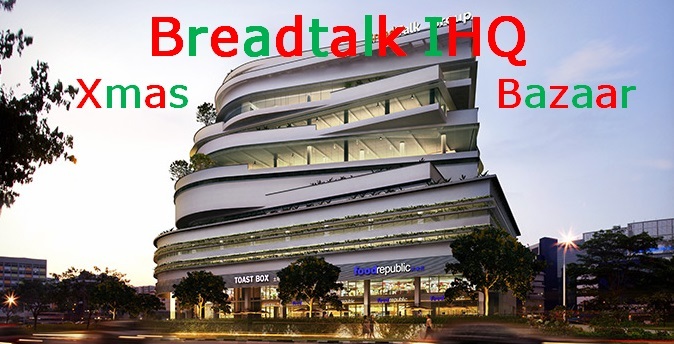 Located a stone’s throw from Tai Seng MRT Station at the Paya Lebar District, the new BreadTalk IHQ showcases the Group’s flagship Food & Beverage brands at Level 1. With a combined seating capacity of more than 550 - BreadTalk, Toast Box, Din Tai Fung, Food Republic and S? extend their hospitality with its signature delights amidst an unique food street experience. Bask in the nostalgic charm of an old China food street brought to life with authentic artefacts while delighting in your favourite hawker delights or exquisite Xiao Long Bao. Level 2 features a variety of retail shops and services which makes BreadTalk IHQ the one-stop destination to work, dine and play! Details as quoted from Breadtalk website.